I’m not a big fan of government conspiracy theories, largely because the people in Washington are too bloody incompetent to do anything effectively. Heck, sometimes they can’t even waste money properly even though they have lots of practice. But it recently crossed my mind that maybe President Obama was born in Denmark. Not in a serious way, of course, but you’ll understand my thought process when you read this passage from a report by the government-appointed Danish Economic Council. It doesn’t mention the Laffer Curve, but the report openly states that an increase in the top tax rate would lose revenue because of changes in taxpayer behavior. …increased taxation on high income earners in Denmark at best is revenue neutral, and may even reduce total tax revenue. This result applies whether one considers the top 10, the top 5 or the top 1 per cent income group. …Using the base estimate of the elasticity of taxable labour income of 0.2, the conclusion is thus that the existing Danish tax system implies an effective tax rate on high income earners that is above – though close to – the tax rate that generates the highest tax revenue. …As an example, the revenue effect of an increase in the marginal tax rate by 6 percentage points for high-income earners is calculated. Using the base estimate of the behavioural response to taxation, this leads to a revenue loss of about ½ billion DKK. …Overall, the scope for acquiring extra tax revenue from high income earners in Denmark is very limited. Yet there are some politicians in Denmark who want to raise tax rates, even though the damage to the economy will be so significant that the government loses revenue! If you’re thinking this sounds familiar, you probably remember President Obama’s infamous statement during the 2008 campaign that he wanted to raise the capital gains tax rate for reasons of “fairness” regardless of whether tax revenues decreased (if you think I’m somehow exaggerating or distorting his words, just go to the 4:20 mark of this video). By the way, the Danish study probably understates how much revenue the government would lose. Their base estimate about the elasticity of taxable labor income (economist jargon for how sensitive labor income is to changes in tax rates) is much lower than Alan Reynolds reported in his recent Wall Street Journal column. Rich people, unlike the rest of us, have tremendous ability to change the timing, composition, and level of their income, which is a big reason why upper-income taxpayers paid much more to the IRS in the 1980s after President Reagan slashed the top tax rate from 70 percent to 28 percent. I’m constantly amazed – in a bad way – that politicians and bureaucrats have been so successful in resisting the insights of the Laffer Curve. The U.S. Treasury Department, for instance, is to the left of the Danish Economic Council and basically assumes that tax policy has no impact on economic performance. The same can be said about the Joint Committee on Taxation on Capitol Hill. This has to be a case of leftist ideology trumping reality, because the evidence for the Laffer Curve is quite powerful – some of it even being produced by international bureaucracies. None of this is to suggest that “all tax cuts pay for themselves.” That only happens in unusual cases where a group of taxpayers – such as wealthy entrepreneurs and investors – have considerable flexibility in their economic affairs. In most cases, the government will collect more revenue when tax rates increase. This is because the impact of the change in the tax rate is larger than the impact of the change in taxable income. But the real question is whether it is ever a good idea to reduce private economic output in order to give politicians more money to spend. To sensible people, that’s the most important insight of the Laffer Curve. P.S. While this discussion has focused on the foolishness of setting tax rates so high that the government loses revenue, this does not mean politicians should seek the revenue-maximizing tax rate. 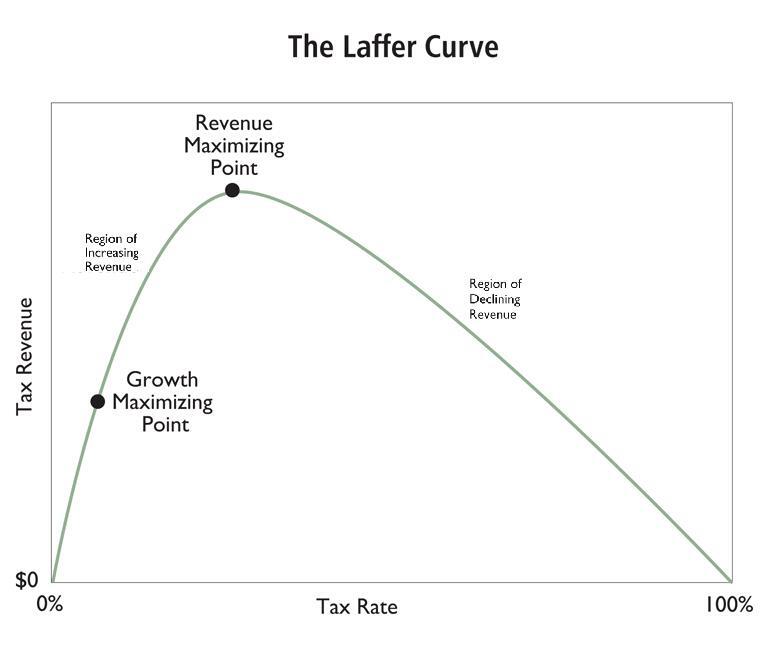 The ideal point on the Laffer Curve is the growth-maximizing tax rate. President Obama will ruin our country if he gets half of what he wants in the next four years. I got to hear Arthur Laffer speak in 1981 and he told us what was going to happen in the future and it did. Fairness is the issue to President Obama and if he clings to the idea of equality at the finish line then he will create a society where the government officials have all the wealth and not those in the private industries. Milton Friedman noted while on the Donahue Show that there is plenty of greed in the communist countries and that is where the government officials control everything. Friedman went on to set Phil straight by pointing out that it is in the free countries where there is a bigger middle class!!! Keep up the good work Dan!! !